I needed to read this book for school, and honestly, I had very low expectations for it. I thought it was going to be a floofy, lame read about a teenage girl that got over publicized and would not be very interesting. Boy, was I wrong! A few pages after I started, I was hooked; I couldn't wait to find out what happened next. Honestly, I hadn't been that excited to read a book from cover to cover in years. And needless to say, forgoing sleep and meals was simply a requirement in order to finish and get onto books 2 and 3 in the series (I have since caught up on both). Seriously, just because it's popular or mainstream does not in any way take away from Collins's skill of story telling. I just wish this book existed when I was a teenager!! The first time I read this I just couldn't put it down!! That's how much I loved the book! It's original. Very original. In the scene of the forest fire, I was honestly scared. I cringed when the fire bombs came at her. The scene near the end with the robot dogs kind of scared me. There are just so many different things happening I this book. First, you're scared because you don't want Katniss to die. Then, you are angry at the Capitol. Not a lot of this book is too sad. When somebody died, I was like yeah, whatever. But when Rue died, I literally bawled my eyes out. I was 12 when I first read the book so you can probably see why. I would totally recommend this book if you haven't read it!! 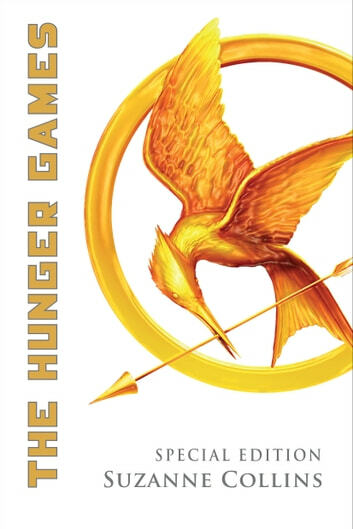 When I watched the movie for this book first, I was so dissapointed and didn't realize what the big deal was. Till I picked up the book and read it. It truly is hard to put down once you get into it. The character development is much stronger and the motives behinds the character's actions are made much clearer. I would recommend this to anyone who has watched the movie but feels disappointed. I think the story is really good. Yes, it jas the clichéd love triangle, but it goes much deeper than that. The love triangle plot, however, makes it easily relatable. The story goes further to include the repression of the a dictator president and the full force of the presidents ability to rule with a harsh hand. The writing can sometimes seem childish, geared towards a younger generation, but over all, a great book for a wide range of ages and audience.